Marketing Approach Archives - Selena Tramayne, Ph.D.
Category Archives for "Marketing Approach"
Let's face it. Your readers... they're busy. Really busy. And they have a ton of stuff occupying their brains. If you want people to read your content, you gotta grab their attention immediately. A great headline does just that. It's not always easy, though, is it? According to Copyblogger, 8 out of 10 people on average will read your headline, but only 2 will read the rest of the article. Writing attention grabbing headlines that get people to click can sometimes be ridiculously hard. Especially when you're looking at a blank screen. I wrote this article to help you never have to start from scratch again. Try out the steps below to see if your headline writing days of struggle are over. As a business coach and consultant who specializes in helping entrepreneurs systemize and streamline their businesses, the last thing I want to do is add to your load. I wrote this article to be as comprehensive as possible. However, just because I share with you multiple tools to help you create powerful headlines, it doesn't mean you have to use every tool. Try the tools out and see which ones work for you. Some will be a great fit. Others not so much. That's okay. 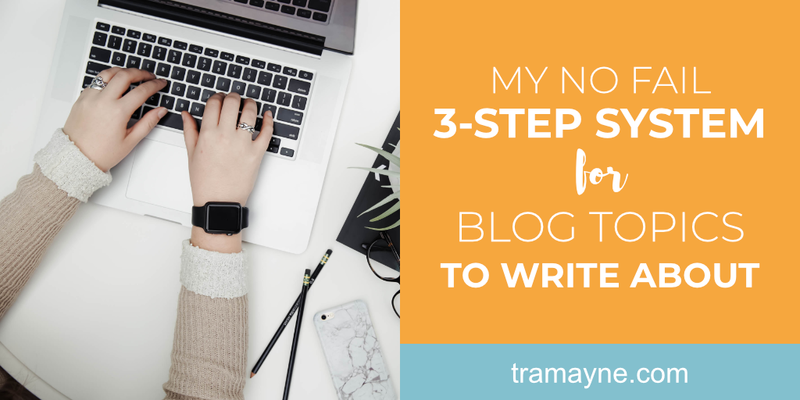 The idea here is to pick and choose which ones work so you can create a streamlined process that makes writing headlines quick and painless. Use these tools to help you discover the topics and headline types your peeps are most interested in. BuzzSumo will analyze what content performs best for the topic you enter. Enter in your topic of choice and you'll get a list of articles with the most engagement. For example, when coming up with headline ideas for this blog post, I typed in ‘write headlines’ as my topic. With the free version, I got back these 10 articles with ‘write headlines’ in various forms in their headlines sorted by most engaged at the top. The ones in bold are the ones that are actually relevant to what I was looking for. Out of this list of 10, there are 4 headlines that match what I’m looking for. Now I can review the headlines to look for patterns and elements that stick out. If you look at the 4 bolded headlines above, you’ll see that they are all ‘how to’ articles. They’re showing people how to write headlines that get results — triple traffic, get clicks, have everyone love them. So that tells me that if I write a “how-to” article about headlines and focus on the results they’ll get, I’ll most likely hit the mark. Note: There is a limit to the number of daily searches you can do. SE Ranking's Keyword Research Tool is similar to Buzzsumo. However, I got a list of 99 websites instead of 10. Unfortunately, it doesn't show the title, just the URL. And the URL doesn't link out to the original article. It links out to metrics about that website. So you have to copy the link and paste it into another browser window. Type in what you’d like to blog about, and BlogAbout will show you fill-in-the-blank headlines. What Makes for A Really Good ________? ____ Steps for Optimizing ________ Performance? What Makes for a Really Good Headline? Some are a stretch, but they’re definitely helpful to come up with ideas. Portent’s Content Idea Generator is similar to BlogAbout, but it spits out the entire headline, not blanks. Some of these are just so fun! You’re supposed to put in 3 nouns that match your topic. I cheated and just put in "writing headlines." Here’s what I got. Not as fun as the previous two sites and some tweaking is needed, but you can see how it could be useful. Writing Headlines Is Not Rocket Science! Learn Them Now! Seven Things You Should Know About Writing Headlines. The History of Writing Headlines. 5 Things You Didn't Know About Writing Headlines. Ten Lessons That Will Teach You All You Need To Know About Writing Headlines. Enhance Your Writing Headlines Skills During Your Lunch Break! Not terrible. I could definitely work with these. Type in your topic, select whether it’s a noun or a verb, and how you’d like the headline to appear (sentence case or all caps), and it displays around 20-50 headlines for several different types of headlines — lists, questions, how to, celebrities, business, motivation, and a bunch more. I got back over 200 headlines. PLENTY to choose from. Every time you come across a headline that captures your eye, capture it in a database. If you have time, tweak it to fit your audience and then put it in the database. If you’d like, you can try my favorite tool for such things — Airtable (affiliate link), an online database app. Not interested in Airtable? A spreadsheet will work just as well. You’ll never again have to come up with a headline from thin air. If you'd like a head start, you can grab my Airtable Headlines database. As of this writing I have a little over 300 headlines in it. You’ll also get my best tips and strategies for how you can grow your business while working less. I share systems, workflows, shortcuts, productivity tips, and other content all designed to make your business life easier and faster so you can go out and play. 25 headlines for each? How in the world am I going to come up with that many? The good news is that if you have followed the first few steps, you’ve probably already got at least 25, if not 100. It’s pretty easy once you go through and use the tools and/or create a database. Just run through your list and pick out the ones that best match your topic and go to town. Then you can take that list and run them through the sweeps in step 5. There are just a few things to check to make sure your headline is as attention grabbing as possible. Is clear. For example, my headline "How to Write Headlines That People Just Have to Click" is pretty self-explanatory. You know what you're gonna get. Is unique. If I type "How to Write Headlines That People Just Have to Click" with the quotes, Google tells me that no results were found for that exact phrase. That's what I'm looking for. Has a sense of urgency to it. 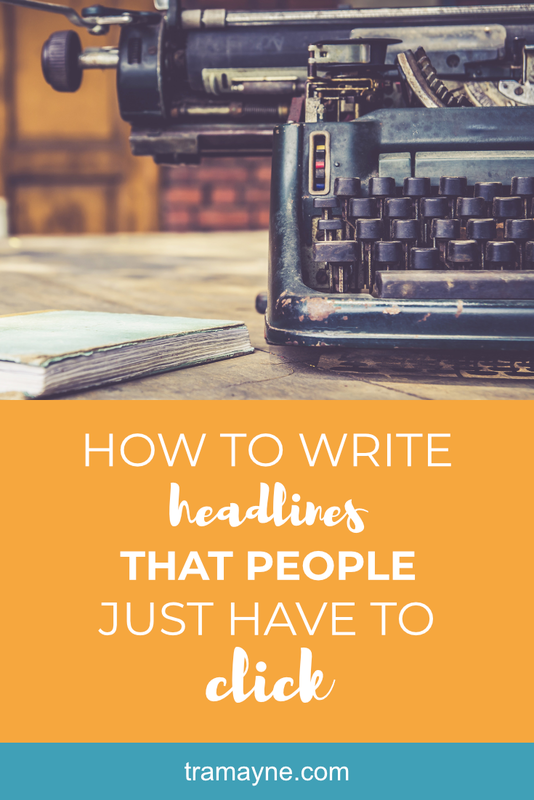 While I don't say, "write your headline now," I am implying that my article can help you with your headline writing challenges immediately by reading the article. If my audience is struggling with that issue, they're going to click. Is useful. For people struggling with writing headlines that grab attention, a 'how-to' article that focuses on a step-by-step process is exactly what they need. Very useful. Is specific. You'll notice this article is not on everything you need to know to write a blog article. It's only about headlines. Look how long this article is and I'm only talking about headlines. Can you imagine the book this would be if I tried to include more? The following websites will analyze your headlines on a variety of different factors. Many give you suggestions on how to improve them. It's not the prettiest website, but it does have some pretty cool features. It determines the Emotional Marketing Value of your headline by using algorithms to compare the words in the headline with the words from their EMV impact list. It’s based on research by Dr. Hakim Chishti. His research found that there is a tonality that flows through language that can be more powerful than the meaning of the words. According to the website, a high EMV headline helps you connect with your audience at an emotional level. I love that it lets me see how my score stacks up against professional copywriters and really gifted copywriters. Along with the overall score, the site will also tell you which of 3 major emotions your headline most impacts — intellectual, empathetic, or spiritual. After you enter in your headline, Sharethrough’s headline analyzer tool spits out scores based on a multivariate linguistic algorithm built on principles of Behavior Model theory and their neuroscience and advertising research. It uses over 300 unique variables, including EEG data and Natural Language Processing, that are designed to help your headlines capture attention, increase engagement, and deliver a stronger impression. You can also get an engagement score and an impression score. Now I've got something I can work with to see if I can improve these scores. Once you enter in your headline into Coschedule's Headline Analyzer tool, you will get a headline score similar to Sharethrough's headline analyzer. This time when I typed in 'How to Write Headlines That People Just Have to Click,' I got an overall headline score of 75, along with an analysis of my headline's overall structure, grammar, and readability. It tells you what type of headline it is, such as how to, list, etc. Did you know that headlines 55 characters long and approximately 6 words tend to earn the highest number of click-throughs? It also shows your headline as if it was in a Google results page. Side note: Headlines under 60 characters will appear nicely inside the Google search results. After running your 25 headlines through one of the analyzers above, you should now have a good sense of which ones will perform the best. Now it’s time to take the top two and A/B test them on your blog or in your email. Most email service providers allow you to A/B test your email subject lines. Do that whenever possible. You’ll begin to see what types of headlines your peeps like. You can also A/B test blog post headlines using a tool such as Thrive Optimize, a WordPress plugin created by Thrive Themes. I love Thrive Themes’ membership program. Check it out while you’re there. They have a ton of good stuff. That’s it. You now have everything you need to write crazy good and appealing blog headlines and email subject lines. Remember, you don't have to use every tool and strategy in this article. Find the ones that work for you, streamline them, and never worry about coming up with headlines again. ps. If you’d like to save time creating your headline database, you can get a head start by grabbing the link to mine. 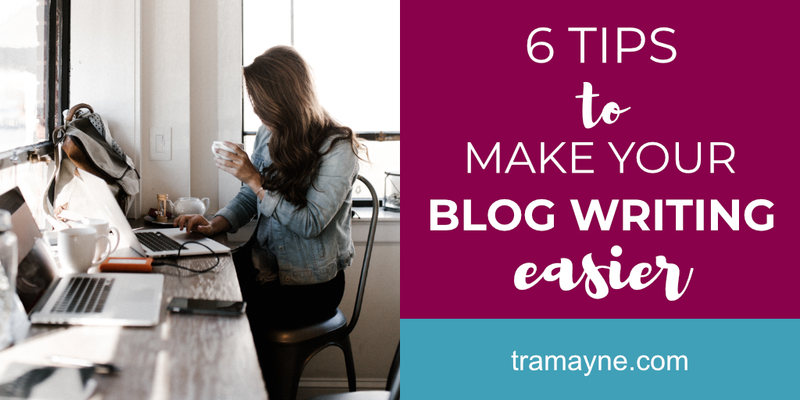 Do you know these 6 tips to make your blog writing easier? I've developed a great system for culling content ideas so that I never struggle with the blank page. If you already have one of your own, great. If not, please feel free to try mine. I've found it extraordinarily helpful. As a coach, I'm sure you know how important content marketing is to your business. But finding blog topics to write about can be challenging. Writing valuable blog posts and email newsletters consistently helps you build authority and trust, while also providing tremendous value to your community. But it's not always easy coming up with ideas, is it? Sometimes we end up staring at a blank screen. As a way to counteract that horrible feeling of "What should I write about?" every time, I came up with this system so I never have to worry about it again. Watch the video or follow the steps below. 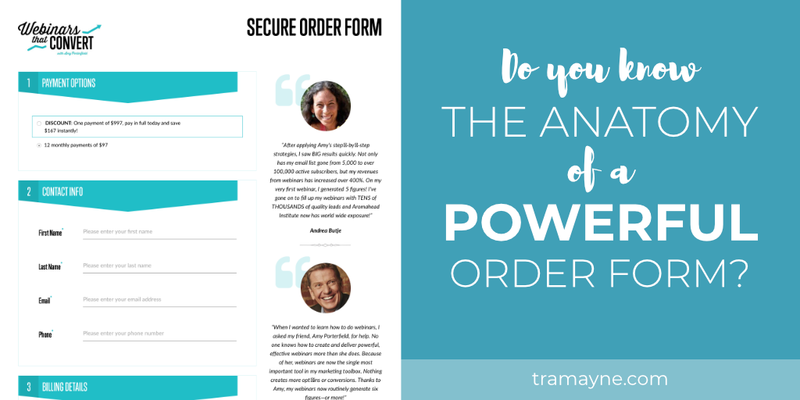 Do you know the anatomy of a powerful order form? One of my clients was looking to improve the order form for one of their signature products. There’s nothing worse than working 12+ hour days on a big launch and then losing sales because of a bad order form.